Actually, I already lied in the title of this article (clickbait incoming?) – at least a little bit. I stayed in Vienna for 72 hours this June which you probably already saw on my Instagram page. However, I just spent 48 hours in Vienna itself. If not less. Is this enough? Not really, but you can already see many amazing things in Vienna, even in just one day. Some people will think I had some beer before I started to write this post but no, I’m totally serious today! So let’s start off from the beginning: My flight was scheduled for Thursday morning and I was quite curious what I can expect in Vienna. I heard a lot of great stories from friends beforehand. When I woke up that morning I felt incredibly sick – fever included. Nevertheless, I went to the airport and quickly we were ready to take off. I thought I felt better. That changed pretty fast though. Never fly sick! I felt like I will explode any moment. Seriously, it was one of the worst hours in my life! At least I couldn’t get annoyed by other passengers because I had to focus on myself. What to do in 48 hours in Vienna? After I recovered a little bit from my illness with a 20 hours (not kidding!) “nap” in my hotel it was time to explore the city. Like usually I had a rough plan that I changed almost every minute quite impulsively. 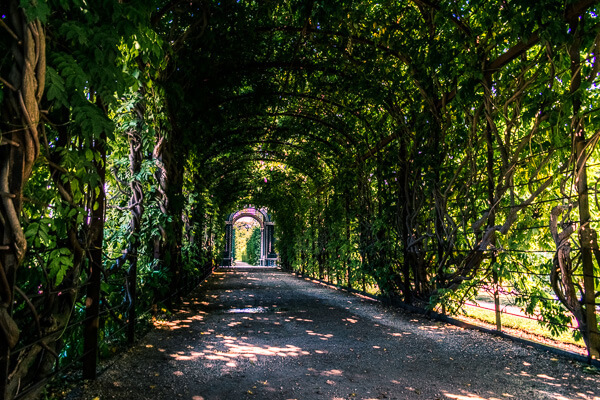 First of all, I have to say that I couldn’t explore everything that I wanted – however, Vienna has so many beautiful spots to offer that I am sure you will find some inspiration in the following list. That’s an obvious choice and I’m not the only one who will recommend you to visit the beautiful palaces in Vienna. 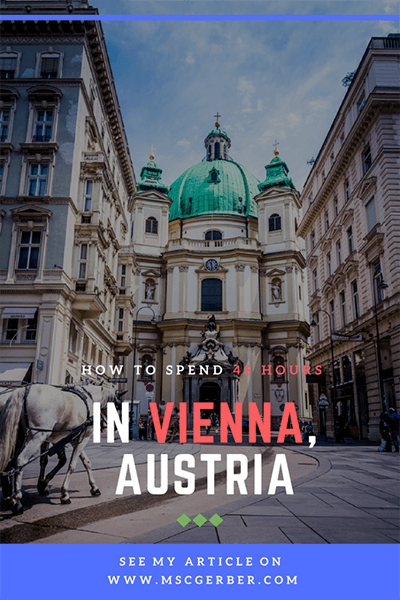 When I thought about what to do in 48 hours in Vienna this was the first point on my Vienna itinerary. And it was the right choice! At 7 in the morning, I headed to the Schonbrunn Palace to make a picture without many people in it. Absolutely worth to arrive there early and literally absorb this view. The majestic palace was opened in 1699 and was used as an imperial summer residence by different Monarchs of the Habsburg empire. With over 300 years of history, this place really impressed me. It is also possible to visit the inner area and the gardens around the palace. To be honest I can highly recommend both of this activities. Additionally, there is another excellent palace with the “Belvedere”. I loved to relax in its garden for quite a time and enjoyed one of my lunch there. If you don’t want to wait in the (sometimes huge) line you can buy a ticket to skip the line. Remember this words if you plan to visit Vienna in the future. If you say these magic words in a restaurant you will get the chance to taste the delicious “Wiener Schnitzel” (Viennese Schnitzel). 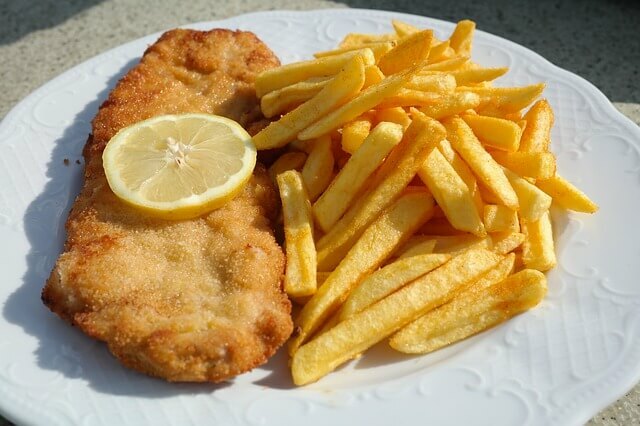 Probably most of you will know what a Wiener Schnitzel is, however, I will still give a short explanation: It’s basically a thin, breaded and pan-fried cutlet made from veal and is one of the most popular dishes of Austria. Unless you tried it you didn’t really visit Vienna! There is no place on earth that serves them as good as in Vienna. I tried it in two different places (what a surprise!) and really liked it in a place called “Schnitzelwirt“. Friedensreich Hundertwasser was an Austrian-born architect that was well-known for his architecture that lacked standardization and a straight line. Most of his buildings shine with bright colors and organic forms. That sounds kind of weird – but it looks amazing. The different colors and abstract forms of the Hundertwasserhaus make it a special place that looks different from every angle you look at it. Especially if you are from a city with boring architecture this place will amaze you! For me definitely a must-visit in 48 hours in Vienna – not only for people that love architecture, also for photographers and regular travelers as it offers a contrary view on architecture – no matter if you like old or modern architecture. What else to do in 48 hours in Vienna? Sadly I was too weak this weekend to see everything of Vienna – and I definitely want to visit this city again. There are plenty of great spots to take beautiful pictures and the historical aspect is even more interesting than that. I highly recommend visiting the Vienna State Opera House! I went there too and loved the style of architecture and the atmosphere. At night it’s even more beautiful and there is a possibility to watch the (expensive) Opera on a huge screen outside sometimes. Also, there are several different churches and cathedrals such as the St. Stephen’s Cathedral, the St. Peter’s Church or my personal favorite the “Karlskirche” which offers a lovely reflection in the water in front of it. Sometimes there are even concerts inside it. When I can promise you one thing about Vienna it’s definitely that you will love this city!